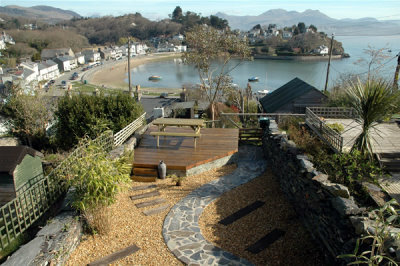 Maweni Cottage is a beautiful 3 bedroom holiday home in the heart of Borth y Gest which boasts fabulous views of the Snowdonia mountain range and the ever changing estuary and harbour. A short walk takes you to some lovely sheltered beaches, perfect for family picnics and barbeques. Further along the coast is Black Rock Sands, a huge stretch of beach favoured by the more energetic who enjoy jet skiing / windsurfing etc. There are 3 bedrooms - 2 doubles and 1 single. 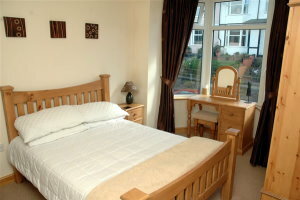 The main bedroom is at the front of the house and has a double bed / wardrobe / dressing table / bedside cabinet. The back bedroom again has a double bed with 2 bedside cabinets an ensuite / wet-room with power shower / toilet & sink.. 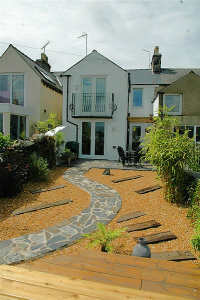 It has fantastic views overlooking the harbour & mountains which can be enjoyed from the stand on balcony. The middle bedroom has a single bed / wardrobe / dressing table & bedside cabinet. The main bathroom is at the front of the house and comprises of a large power shower / toilet & sink. The kitchen is fitted with a large 900mm gas oven, washing machine, dishwasher, microwave, large fridge freezer and all the necessary mod cons. There is a breakfast bar seating area for four. The dining/living room has a modern leather suite, coffee table, TV / DVD & CD player (there is a selection of DVD's and CD's for use). Dining table unfolds to seat six. Outside the garden has been transformed into a beautiful area to enjoy eating alfresco while taking in the amazing view. A barbeque is at hand for those summer evenings. Also available under the stairs are the usual essentials for the beach - wind break / picnic kit and folding seats. Borth-y-Gest is a small picturesque laid-back harbour village which enjoys beautiful estuary and mountain views. 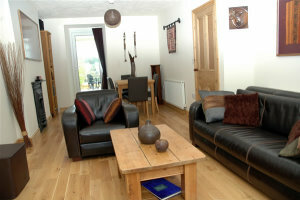 Amenities in the village include:- local shop / tea room cafe / Bistro restaurant which overlooks the harbour. A 10 minute walk will take you into Porthmadog where there is a larger selection of shops & restaurants. There is a lovely choice of beaches only a short walk away.